It’s an exciting time for the animals of New York City, and the people who love them. Compassionate individuals, shelters and other animal welfare organizations including Rescue Paw Foundation are working together to create a brighter, safer future for homeless pets in the city and throughout the nation. The Best Friends Benefit to Save Them All, honoring Candy Uell and Justin Theroux, was a huge success raising over $500,000 for the animals. The benefit may just be one event, but to the animals, it means the world. That’s because it helps save their lives. With the help of funds raised by the benefit, homeless dogs and cats everywhere will find homes and second chances. 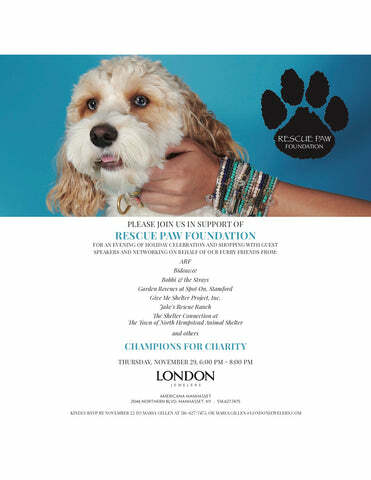 Rescue Paw Foundation is participating in Americana Manhasset’s Champions for Charity. From Thursday, November 29 through Sunday, December 2, over 70 participating Americana Manhasset and select Wheatley Plaza stores will donate 25% of designated full-price pre-tax purchases to the participating organization(s) of the customer’s choice. Purchases are not automatically eligible; you must register for a complimentary Champion Number. Simply designate “Rescue Paw Foundation” as your charity of choice and present your Champion Number when making purchases during the event. 25% will be automatically calculated and submitted to Rescue Paw Foundation. For more information visit championsforcharity.org or call 800.818.6767. See event details. 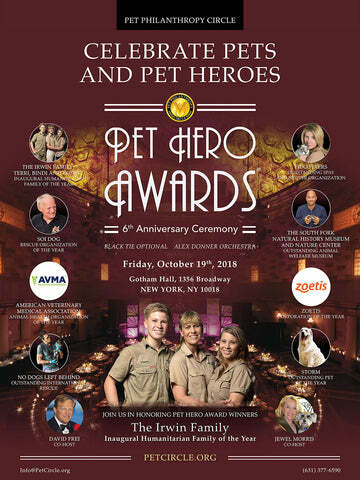 for the Pet Hero Awards, 6th Anniversary Ceremony. Terri, Bindi, and Robert Irwin will be receiving the Inaugural Humanitarian Family of the Year Award for their tireless commitment to saving animals across the globe. The Pet Hero Awards showcase outstanding contributions inspiring everyone to become involved in defending the rights of animals. Together, we promote public awareness of the causes, individuals and organizations that protect our animals. Vice President invite all animal lovers to come to the gala. See event details.